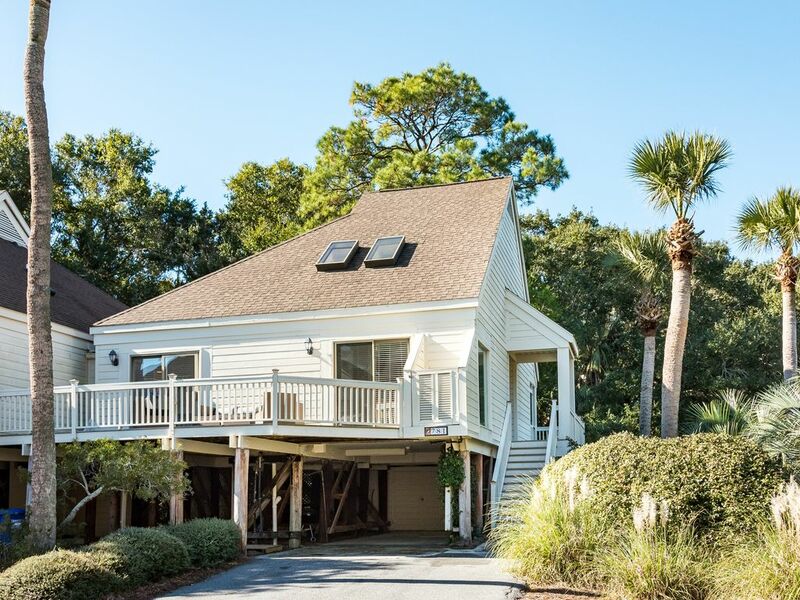 Relax and enjoy the best of Seabrook Island at 781 Spinnaker! Our villa is just a 5 minute walk to Pelican Beach and the Seabrook Island Club Beach Club! Our well appointed villa is meticulously maintained and updated. All wood and tile flooring with NO wall to wall carpet! Stunning eat-in kitchen, full size laundry room, dining room with seating for 8, screened porch, 2 story living room comfortably appointed with two sofas, chair and ottoman, wall mounted HDTV, full bath and master bedroom. The master bedroom boasts a king size bed with new furniture in 2018, designer bedding, spacious closets and a wall mounted, flat panel TV. Upstairs guests will enjoy spacious bedrooms, one with a queen-size bed, walkout deck and TV and another bedroom with twin beds. The second floor bathroom has a tile shower and oversize vanity. Our WIFI provider is Comcast. All furnishings and appliances are continuously remodeled and updated. We even have a minifridge! There is no comparison to any other Spinnaker villa! A charcoal grill is available for guest use. You and your guests will have complete access to Seabrook Island's stunning, low country Beach Club with zero entry pools, incredible oceanside bar and grill with sweeping 180 degree views of Pelican Beach and the Atlantic Ocean, fine and casual dining and club house with Seabrook's award winning golf courses are all just steps away from our beautiful villa. These amenities are available to our guests at NO ADDITIONAL COST. Pelican Beach with its amazing sunsets and wide, sandy beaches is a 5 minute walk from our Spinnaker villa. This is resort style living at its best! You will also enjoy local, professional property management through Wyndham Vacation Rentals. Enjoy rounds of golf on the Ocean Winds or Robert Trent Jones designed Crooked Oaks golf courses, play tennis at the Racquet Club with clay courts, relax at the Beach Club with resort style swimming pools and ocean side restaurants, ride horses at the Equestrian Center, swim laps in the indoor pool, schedule a massage or lift weights at the Lake House. Usage fees may apply. You will also enjoy mild and sunny year-round weather, 3 miles of beautiful, uncrowded beaches, biking on the island's private roads and paths, fishing, crabbing and alligator, deer and dolphin sightings. Seabrook Island is located just one mile from Kiawah Island and Freshfields Village Marketplace, an island style shopping and dining complex. Historic downtown Charleston is a 22 mile drive. ABSOLUTELY NO SMOKING AND NO PETS OF ANY KIND! Even though we live in Charlotte, our family found out about Seabrook Island through relatives who live in Boston. It was a well kept secret back then, and it is still the Charleston area's hidden jewel for pristine, uncrowded beaches and country club amenities in a private island atmosphere. Our family has been vacationing at Seabrook Island for as long as our children can remember and we look forward to many more happy years on Seabrook Island. Compare our photos with almost any other villa on the island. We have one of the most pristine, updated villas in this price range! Granite in kitchen, tile showers, wood laminate and tile flooring, screened porch, no carpet anywhere!! 781 Spinnaker looks like a model home! There is no other oceanside community that compares to Seabrook Island. With its private beaches, golf, tennis, equestrian center, crabbing dock and access to Charleston, our family has made many happy memories and met new friends on Seabrook Island. Our villa is across the street from the beach and by booking our 3 bedroom Spinnaker, you can't get much closer to the beach in this price range in a unit that feels like a private home with no shared walls and a private driveway. Parking under villa for one car and the villa can easily park 2-3 cars back to back under the villa and one car to the right. Kitchen towels and bath towels and wash cloths are provided. The Lake House at the front of the island has a fitness center with indoor/outdoor pools, fitness classes, massage and fitness/weight room. Daily use fee applies. Pull out sofa bed, wicker chair and ottoman, full size sofa and love seat. Samsung 3 door, French door refrigerator with ice maker. There is also a mini fridge in the laundry room behind the door. Mr. Coffee stainless steel coffee maker. This coffee maker uses basket style filters. Fully equipped kitchen with glassware, cutlery, dishes, bowls, plastic cups, dish soap and dishwasher soap, paper towels, utensils, many purchases at Ikea or Crate and Barrel. Updated kitchen with granite countertops, tile backsplash, stainless steel appliances including very quiet dishwasher, French door refrigerator, ice maker and built in microwave. Kitchen with seating for 4 at table and dining room with seating for 6-8. There is a small collection of books in the villa. There is a game room at the Beach Club. Several games and puzzles are in the villa. You can rent bicycles and have them delivered to the villa prior to your arrival and they will be picked up after you leave. Decks on upper level and main level and screened porch on main level. It is a very nice, clean, and well stocked beach home. Very close to the club house. We love Seabrook Island! The beach home was great! Very clean, updated, and well stocked. I would highly recommend staying there. Close to the club house and pool. Great location, great property. When we walked in it was clean and cool. I realized why they keep the air downstairs at 71 degrees because upstairs will hit 80 degrees w/ AC full blast. Our little 15 month old slept great up there however I'm not sure I would have. The living room has great couches with beautiful large windows. The kitchen comes fully stocked with all the utensils one would need. The beds were all comfortable and clean. The location is a 5 minute walk from the beach, and 10 minute walk from the pool. We opted to bike to the pool instead which was fun. We would definitely rent this VRBO again. We had a wonderful time on Seabrook Island and exploring the Charleston area. The Island was just perfect and so was your condo. We truly enjoyed our stay! Your condo was well appointed, comfortable, and beautifully decorated. We couldn’t have asked for more! In addition to the wonderful accommodations, fantastic amenities, and beautiful island, Liz, the owner, was wonderful to work with . We would love to visit again and we will be sure to recommend your property to anyone visiting the Seabrook/Charleston area. My family and I have stayed at this condo at least 4 times and we love it! It’s a short 5 minute walk to the beach. The kitchen is well stocked and had everything we needed for the week. The bathrooms were updated and clean and the beds were comfortable! We love that it is an end unit. My teenagers loved riding bikes to the pool! We will stay here again over the summer! Great villa for a getaway by the sea! 781 Spinnaker was a great place to spend the winter for us from the frozen north in Maine. It was very close to the beach, and the amenity card allowed us to take advantage of the many opportunities at the Island House, Lake House, and Beach Club. The kitchen was spacious, very well stocked with all the items needed for cooking, and the stainless appliances and granite countertops were very nice. The living and dining area, with nice wood and tile floors, was bright and cheery, with a large cable TV, very comfortable sofas and chairs, and well lit. The bedrooms were large, with very comfortable beds. The two bathrooms had very nice tiled showers. Overall, it was very relaxing place to spend a vacation. The proximity to Freshfields Village, with it's many shops, restaurants, and great grocery store, was very handy, and the 45 minute drive into downtown Charleston, allowed an easy trip to the many attractions of that great southern city. TERRIFIC Spinnaker! Great BEACH Location! 781 Spinnaker is a wonderful property as the owners take great pride in keeping it up to date and constantly upgrading as with new woodfloors, and lovely tiled floors throughout the others areas. The kitchen is well appointed with pans, serving pieces, utensils and many small electrical appliances. The granite surfaces and stainless steel appliances invite you to cook in this sit in kitchen. Although, there is a lovely dining room area in the larger open plan with LR and a great seating area for reading, watching TV or just chatting together with a larger group of family and friends. Lots of games for the kids and family to play as well. The three bedrooms are spacious with lots of closet space for clothes, suitcases, and more. The master bedroom downstairs has all new furniture and an extremely comfortable king bed! Especially enjoyed having a separate area for the laundry and a an extra smaller refrigerator to keep the overflow drinks cool! It has been a wonderful experience working with the owner directly. With the amenity card that comes with this Spinnaker, I have enjoyed playing Pickleball, taking a golf clinic, going to the Lake House to exercise, and having full access to the Island House and Beach Club. My favorite thing is a quick stroll to the beach and taking a beach walk to watch the sunset, especially during low tide. Bring a bike and enjoy bicycling when the water is low. You can access both beaches then! We have enjoyed 781 Spinnaker so much, that we have rented it again for another winter. It has been a wonderful experience! Enjoy the best of the low country from our beautiful villa. Don't miss Seabrook's gorgeous beaches, the Seabrook Island Club amenities and off the island plan to visit the Live Oak Tree, the plantations, historic downtown Charleston and dine at the Fat Hen and Wild Olive. Weekly/nightly rates include amenity cards to enjoy the Seabrook Island Club. SC tax, cleaning fee and administration charge are added to the nightly/weekly rate. Please inquire for details. Thank you.